Hi friends! I'm blogging my last post over on the Scrapping Everyday Miracles blog today and sharing some tips and techniques. Even though my time there is done, I've enjoyed being part of this wonderful design team. 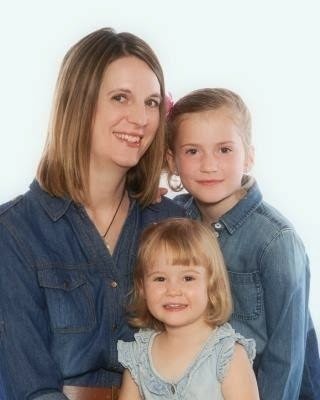 These girls are awesome! 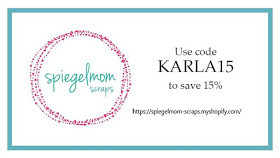 For my tip/technique today I'm talking about Digital Stamps. 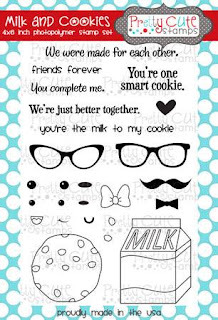 If you google or check Pinterest for digi stamps you are sure to come across many, many very cute options available - many which are free! 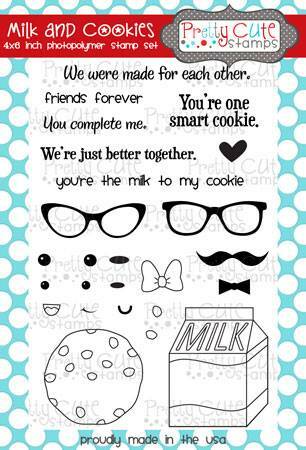 I found this adorable Macaron Stamp on Jane's Doodles blog. 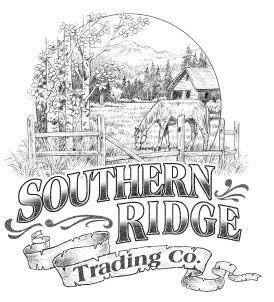 It is a JPEG that you can simply right click and save to your computer. I have a PC - not a mac, so that's what I do on mine ;) This saves the image as a photo and I can print it off whatever size I wish! - Print in Fast Draft on your printer. This is the setting that uses less ink and reduces any bleeding of your image. - Heat set your image after printing. - Print on white cardstock. I just feed the sheet of cardstock through my printer and don't even change the paper settings. - Using an alcohol based marker, such as Copics or Prismacolors, prevents bleeding of the ink. You could even use coloured pencils! I have used water based markers before, but you have to be careful to not touch the black lines too much, so I usually stick to my Prismacolors. 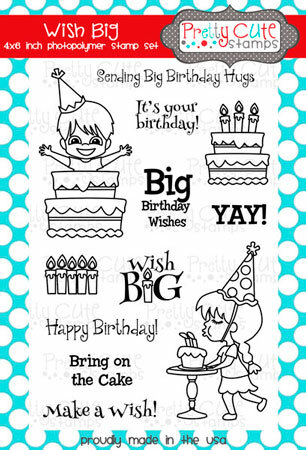 After I coloured my image in I used some pretty Stickles to add some shiny sparkles to the icing and I stamped a sentiment using a stamp set from CTMH. Inside, I used one of my fav sentiment stamp sets - Believe Script from Pink & Main. I fussy cut around my image and popped it up with foam dots over my patterned paper background and added some washi and sequins from 28 Lilac Lane. Thank you so much for stopping by today! I hope you enjoy a fantastic week, and let me know if you decide to try out a digi stamp image! Be Original Art Foamies Tag! Good morning! Hope you are all having a great week so far. Soccer started for my 4 year old Monday so it's been busy times getting all that ready, but I did manage to sneak in a quick tag to share with you all! A while ago I borrowed some pretty Art Foamies stamps from my friend, Laura, and I had so much fun creating some awesome backgrounds. If you've never heard of Art Foamies stamps before you can check out this video here. 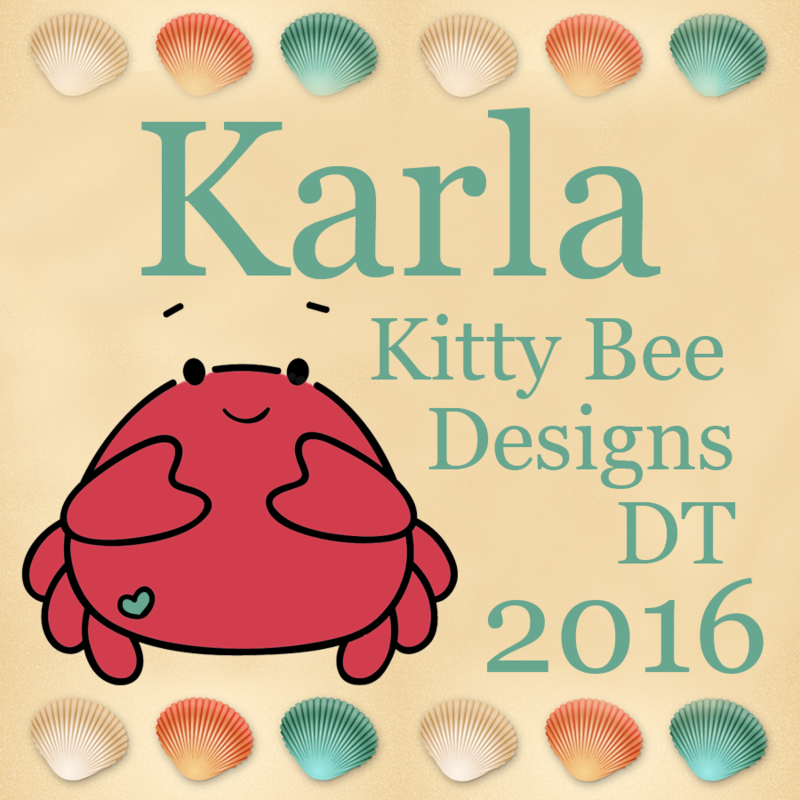 I stamped this pretty dragonfly onto a manilla tag and stuck it in my drawer until just the right time! Since I already had my background stamped, I decided to use my Distress Inks to sponge on a bit of colour and added some brown ink around the edges. I used some blue and green Distress Inks to colour my seam binding ribbon before tying it onto my tag. A bit of Ground Espresso brown Distress Ink finished the edges of my chipboard flower sticker and coloured the ribbon along the bottom of the tag. That's one reason I love buying white trims and ribbon - I get to colour coordinate them with my project! This 'be original' stamp is from the Crazy Talk stamp set that coordinates with the Crazy Birds stamps. I used an Archival black ink to stamp over my Distress Inked background. You can see a bit of the Crazing Collage Medium from Tim Holtz that I brushed over the tag to create a subtle texture. A few light green pearls finished off my project. Thank you so much for stopping by today! Wishing you a wonderful week ahead! FCCB #275 - Mother's Day! 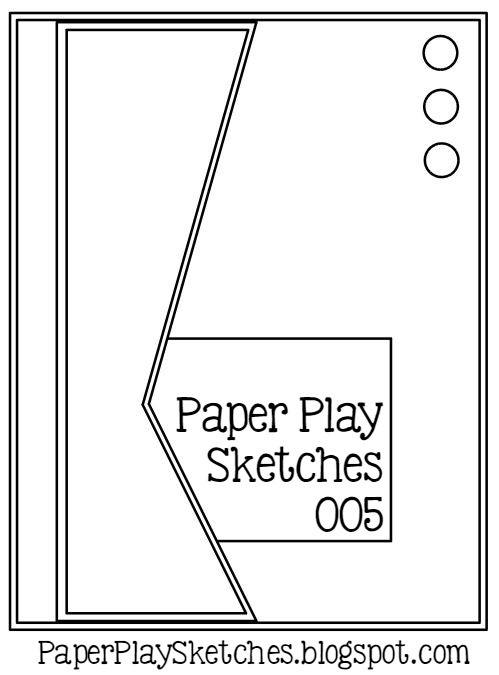 For my project this week I've chosen to use a Make It Now project using Cricut Design Space. I love that there are so many projects available, with new ones added all the time, that are ready to go! I love that I can customize them or make them as is. I find just by adding some patterned papers from 6x6 paper pads I can change the project to suit me. 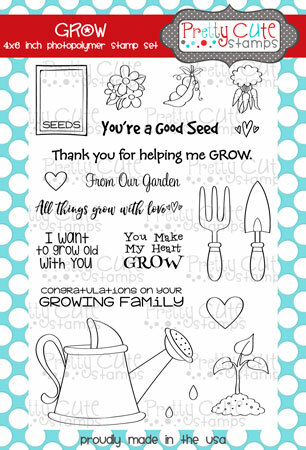 You can find this Floral Happy Mother's Day Card in Design Space here. I love the inlaid look of this card where the negative cuts are filled with the same shapes cut with patterned papers. I took the middle flower, which I had diecut out of white cardstock, and first embossed it with an embossing folder and then dropped Izink Inks on the paper and blended them with a bit of water to create a pretty watercolour look. Inside, I used some stamps I got with my new Cricut Artistry cartridge from CTMH! It was awesome that I could save a bit of $ buying the digital access since I don't need the actual cartridge. I cannot wait to play with this cartridge! Thanks so much for stopping by! 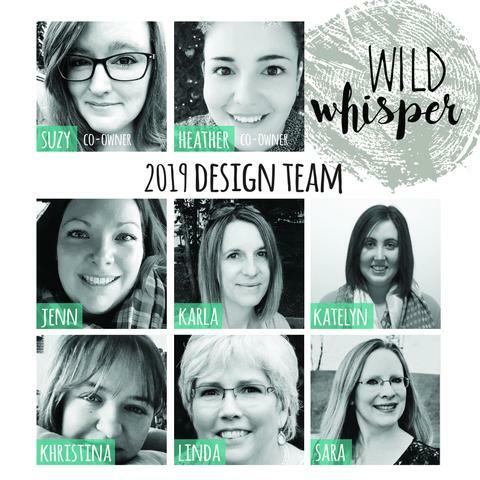 Be sure to head over to the Fantabulous Cricut Challenge blog to see what all the other Design Team members have come up with for this challenge, and enter your own project for a chance to win an awesome gift certificate! 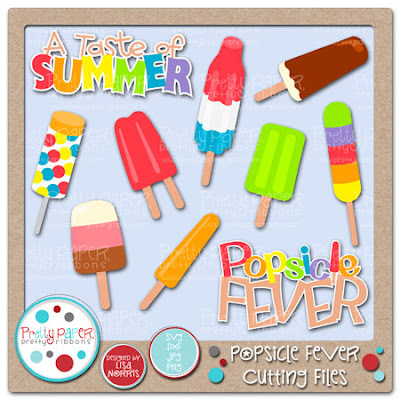 PPPR Guest Designer - Popsicle Fever Layout! I'm really excited to be featured on the Pretty Paper Pretty Ribbons blog today as a Guest Designer using some amazing SVG diecut files available from the PPPR Store! I used the fun Popsicle Fever cut files for my bright title and popsicles and the pretty Background Lace 2 cut files to create the diecut triangle background above and below my photo. Some BoBunny, Simple Stories and Shimelle papers added some more fun elements to this fun summer page. 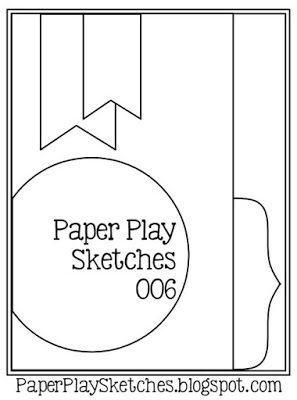 I used sketch #8 from the Ready Sketch Go online scrapbook class - I love the grid like layout of this design! For the yummy popsicles I cut both layers using the same colour cardstock, and then used markers to create a darker shade for the bottom layer. I love the layered title and the way the 'popsicle' letters stand out! 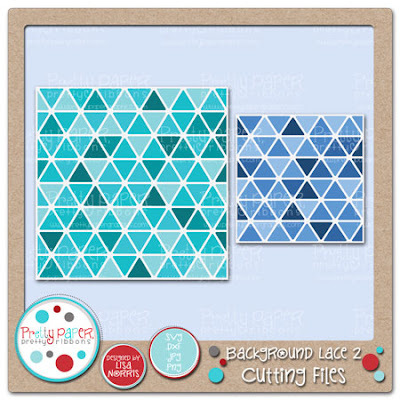 One of my favourite elements of this layout is the white triangle diecut background! This SVG file is actually a square, but I sliced it in Cricut Design Space to be a rectangle and I layered some ombre paper underneath. You could also simply cut the square down to the size you like. I think this background would look awesome on a card too! I used a stamp from the Just Chill stamp set from Pretty Cute Stamps - 'Anything's Popsicle' on the layers of paper I clustered in the corner. 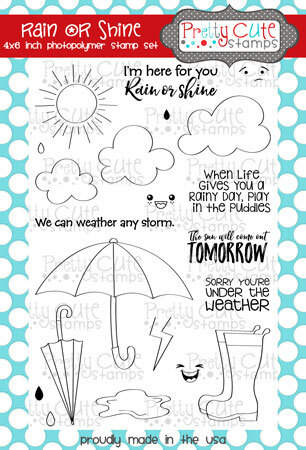 There are so many great sentiments and cute popsicles in this stamp set! Thank you so much for stopping by today! Be sure to head over to the Pretty Paper Pretty Ribbons blog to see all the fantastic projects created from the awesome files at the PPPR Store! I am really loving playing with my new Color Burst powders! They do such fun things when you add water to them, and I love the vibrant watercolours they make. I had fun making some background papers using them last week with my 4 year old. She thought it was really cool too! Having that pretty background already done made this card quick and easy. I used a face stamp and words from a Dina Wakley stamp set to stamp on my Color Burst background before cutting my face out with some Spellbinder's nesting dies and then popping them up over my script paper background and washi tape. I love the words that come with the face stamps! The butterfly stamp is from a Prima set that a friend recently sent me. After stamping I hand cut around them and glued them down in the middle only so I could pull up the wings to add some dimension. Inside, I used this sentiment from a stamp set I love from Pink and Main - Believe Script, and used a strip of the background paper along with another butterfly. Thanks so much for joining me today! I hope you get some crafty, inky time this week! 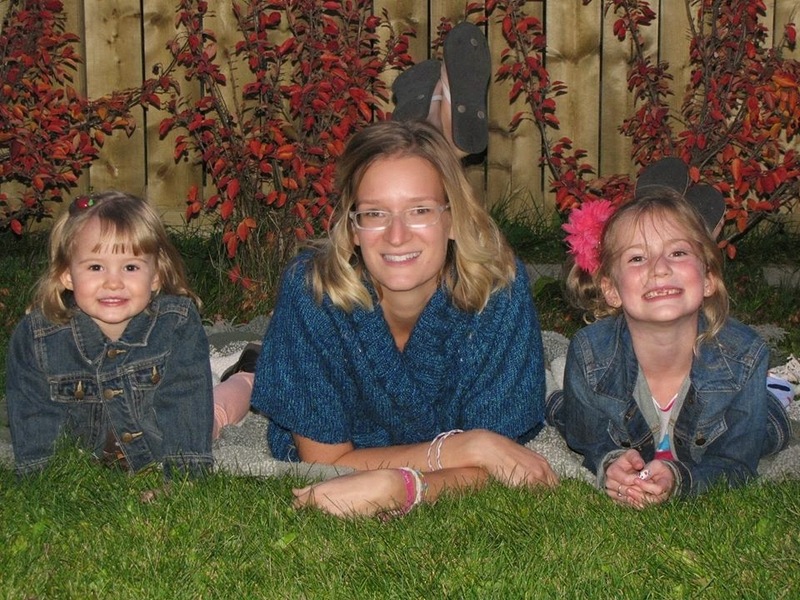 It is a wonderful, sunny, spring day here in Calgary today! We are getting out to enjoy the weather very soon, but I first wanted to share this cute card I made with the Many Thanks set from Pink and Main and the Paper Play Sketch this week. I realized I need a few more thank you cards in my stash! How cute is this little cell phone?!! I used Prismacolor Markers to colour in my stamped images. Inside, I used another lovely sentiment from the set. I had some little adhesive dots in my stash - perfect for the home button on the little phone, and to add dimension to my card and continue with the polka dot and colour theme! Happy Monday! Today, I wanted to share with you this cookie jar card I made using my Cricut and some of the adorable stamps from the Pretty Cute Stamps Milk and Cookies stamp set. I love these happy little cookies with their cute little faces! I bet they'd also look cute as white chocolate chips with cranberries... Hmmm, now I'm getting hungry! 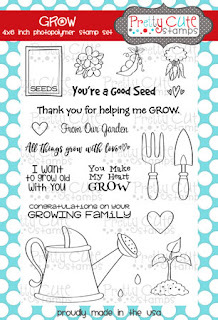 I used a cut file by Lorrie Nunemaker for the sentiment inside the card by changing the file to the write feature and then colouring in the letters and mixing bowl with markers. The other baking supplies are from a cut file from the My Treasured Kutz store. I used the heart stamp from the set on my little tag tied with twine and included a Biscotti Tea to send along to a friend - 'cause who doesn't love cookies and tea?!! Here's a close up of this sweet stamp set. I love all the cute accessories they have! Thanks so much for joining me today! Have a happy, crafty week! 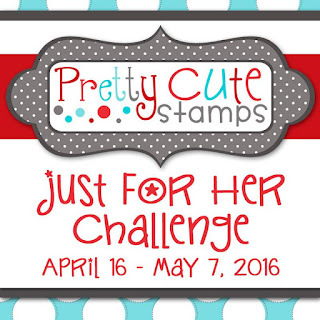 Pretty Cute Stamps April Challenge - Just For Her! It's time for another awesome challenge over at the Pretty Cute Stamps blog!! This month the challenge is 'Just For Her' and we would love to see all the pretty creations you make for the girls in your life! 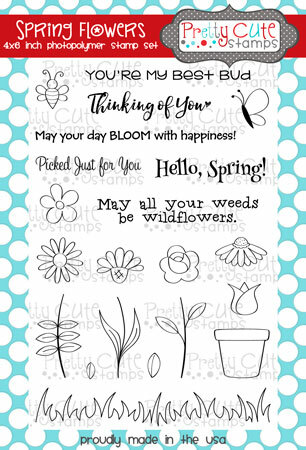 I wanted to make a birthday card for my sweet niece and I recently saw some pretty paper bag envelope packages on Pinterest, so I thought I'd use my Cricut and the Spring Flowers stamps from Pretty Cute Stamps. I used the cute little seed packet from the Grow stamp set and popped it up on a bit of metallic purple thread. The heart stamp is also popped up on foam dots in the middle of the polka dot bow, which I outlined with the new Dylusions white paint pen. Lovin' this! I love that you can see the sentiment on this card through the little envelope window! Below you can see what the inside looks like when you pull it out. I used the SVG files from the Pretty Cute Stamps store to first cut all the outlines from white cardstock with my Cricut Explore, and then I stamped them all before colouring them in with alcohol based markers. I've been playing with my Color Burst powders and I found they worked really well on the Recollections resist paper pad I have. You can see this purple and orange resist background peeking out behind the doily. 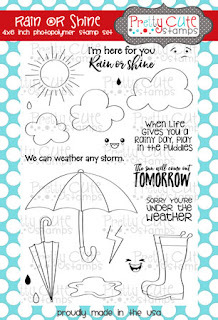 I had to add this happy little sunshine and cute cloud from the Rain or Shine stamp set. A few beads from May Flaum's 28 Lilac Lane embellishment kit, Attic Findings, created the perfect little butterfly trail around these lovely flowers. On the back of both my envelope and card I stamped some birthday wishes from the Wish Big stamp set and added a few more stamps, leaving room to write a special birthday message to my niece. Thanks so much for joining us today! Be sure to hop on over to the Pretty Cute Stamps blog to see what all the other Design Team members have come up with for this fun challenge - You can enter your own project using a Pretty Cute Stamp here for a chance to win a prize!! And of course, have a wonderful weekend! Be Happy Single Layer Card! 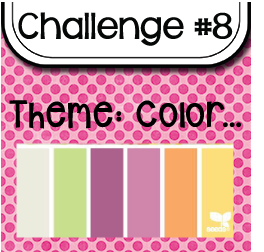 Scrapping Everyday Miracles April Challenge!